In the early 2000s Greg Sharrow and audio producer Erica Heilman conducted a set of interviews under the auspices of the Vermont Folklife Center for the Veterans History Project of the Library of Congress. From those interviews, an audio documentary was produced called “Prisoners of War: A Story of Four American Soldiers,” which focused on a group of Vermonters who had been captured during the Battle of the Bulge. Over the course of our research, we interviewed several veterans who shared powerful stories with us about their POW experiences but were not included in the documentary. In this episode of VT Untapped, we’re proud to share one those stories through an interview with Maj. J. Francis Angier. Francis grew up on a farm in New Haven, Vermont. He learned to fly at the tiny Bristol airport in the next town over and flew solo before even getting his driver’s license. Before and after the war he was a farmer but his service as a pilot also extended throughout his life. He has been a member of the Vermont Air Guard and the Vermont Army Guard. In this episode Francis speaks to us about his service in World War II. 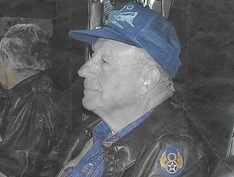 He was a member of the 8th Air Force and flew 33 missions during the war. On October 25th, 1944 his plane was shot down from an altitude of 30,000 feet. Several of his crewmen were killed in the crash, but Francis survived multiple injuries and interrogation by the local magistrate. He was brought to Stalag Luft III, a POW camp in the German province of Lower Silesia near the town of Sagan (now Žagań, Poland), 100 miles south-east of Berlin. He was held for six months before the U.S. 14th Armored Division liberated the prisoners on April, 1945. Today, Francis is 95 years old and lives in a Veterans home in Land ‘O Lakes, Florida. Thanks to his son, John Angier Jr. for speaking to us as we prepared this episode. To learn more about this incredible story, read Francis’s book, Ready or Not: Into the Wild Blue. For more stories from veterans in Vermont you can purchase the Prisoners of War documentary CD on our website, purchase it on iTunes, or contact the Vermont Folklife Center for access to our archives. Francis in 2008 with his first great-grandchild. Maj. Angier was originally interviewed by VFC Folklorist Greg Sharrow and audio producer Erica Heilman on October 3, 2003.